We have carved a niche as one of the most prominent Urine Collecting Bag Manufacturers, based in India. The Urine Collection Bag is made up of high grade PVC that ensures zero leakage with ensured high hygienic level. The pipe attached to the Disposable Urine Collection Bag have bigger diameter that facilitated in the free flowing of urine. 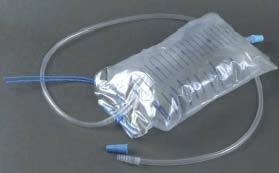 The valve present in the bag also prevents backflow of the fluid and migration of bacteria. The maximum capacity of the urine collecting bag is approx 2000 ml. the urine collection bag are also available with butterfly hanger, bottom outlet and stick type hanger.